As mentioned in last week's post - we were able to find the perfect sofa table! I'm sort of impatient and Gary is well aware of this trait - so he scoured Craigslist and found a brand new Ikea sofa table in the same color that we were planning on purchasing. Not only did we not have to drive out 45 minutes to go to the store, but the couple selling it lived 5 minutes from us!! I haven't decorated it fully yet - but it's done exactly what I was hoping it would do...add more storage!! It's amazing what this little change has given our apartment - but there is actually more room to move around now that we don't have an ottoman in the way! Saturday night we went to see the movie Lucy. This wasn't a movie I thought I'd like - but I was pleasantly surprised. It's a mix between the movie Limitless (with Bradley Cooper) and a science fiction thriller. Imagine a person that is able to access parts of their brain that scientists had only ever theorized about...and then it happens! Short, sweet and to the point! It was obviously not enough to see Amanda only once on her trip here -so we were able to meet up on Saturday night and share a few laughs! Notice how they are bundled up and I'm in a strapless dress...just goes to show 70 degrees is super warm to me! On Sunday night I made my favorite summer risotto. 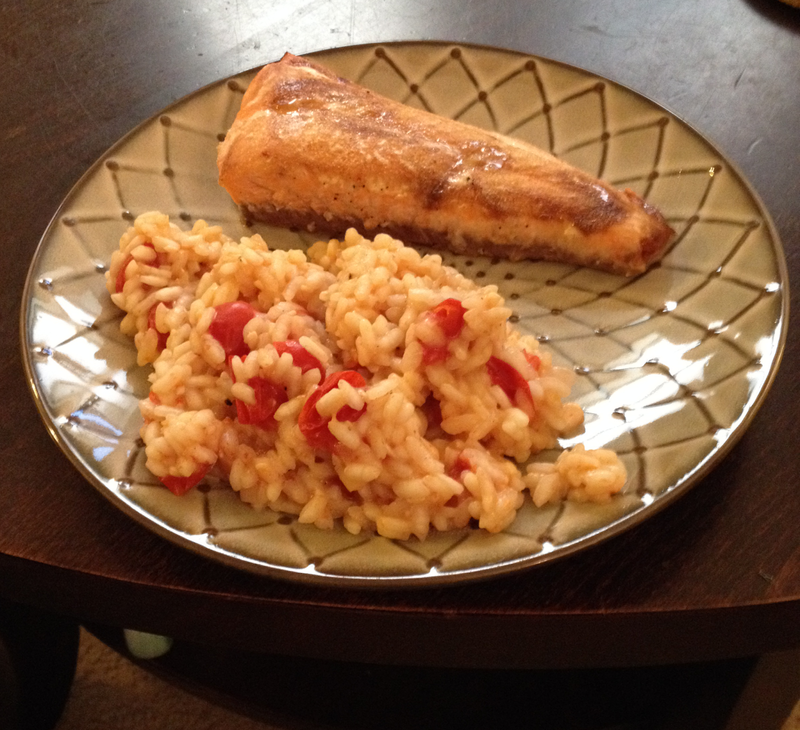 I tried a new way to make salmon and it was delicious...you could really taste all the flavors! This meal has the man seal of approval!! 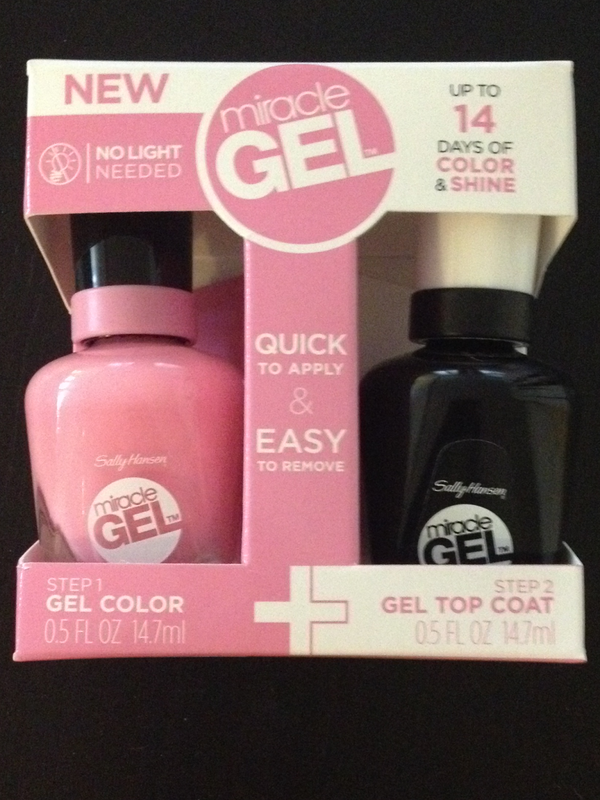 I have been excited to try out Sally Hansen's miracle gel - you don't need a light to cure it and it's said to last up to 14 days. We'll see if it works, but my first reaction is positive. It doesn't have the same consistency as regular nail polish so I actually did 3 coats because it was a bit streaky with just two. Have you used this yet? After the closet clean out last weekend and seeing the success of so many bloggers Blog Sales - especially Annie's - my friend Erica and I decided to host one of our own! So tomorrow (Tuesday) the sale goes live and I hope you'll come back to see some of the goods we have! It's not terribly huge - just about 20 items, but we have some wonderful gently used and new clothing we'd love to sell! I love having fresh flowers in the house, but even more so on a Sunday because it gives me the refresh I need to start the week!! These beauties were $4.99 at Trader Joe's! Also excited that this beauty arrived on Friday!! It's just as pretty as I imagined & can't wait to wear it! Hope you all have a wonderful start to your week and make sure to stop by tomorrow for some great items!! Yay for finding that sofa table on Craig's List! SO awesome!! And still totally jealous of you and Amanda getting to hang out. I would have been super bundled up too LOL! Let me know how that gel polish is... I've been super curious! Woohoo a blog sale! Love your style, so I know it will be fabulous! sometimes you just have to try your luck on CL and see where that takes you - so glad you found that table. Way to go on the craigslist find! That's going to be perfect! I'm so excited for your blog sale tomorrow and so proud of you for getting organized :) I love that I helped provide some inspiration too!!!! See ya in the am. Love a good craigslist find!! You had a pretty stellar weekend! That's awesome that you were able to find the exact sofa table that you wanted on Craigslist - that's the best. I am looking forward to checking out your blog sale tomorrow! I'm contemplating doing the same thing, but perhaps only on Instagram. Loving the sofa table! How perfect she was only 5 min away! I actually really want to see Lucy so I'm glad you liked it! I love you're in strapless and Amanda's wearing a scarf hahs! Looks like you had a fun weekend! I love the sofa table that you guys found! It looks great! I am totally jealous of your meet up with Amanda!! I had to laugh at the jacket because a few weeks ago I was out past 10pm and I remember shaking when we were walking back to our cars. I made the comment that it was probably 70 degrees and it just felt really cold because it has been around 100 with a lot of humidity lately. Sure enough the temperature was 71! Haha! Crazy what we get used to. The sofa table looks great! Awesome that you were able to find it on craigslist. I've never heard of that nail polish, but I'm interested to see how it works for you! Those flowers are gorgeous too. 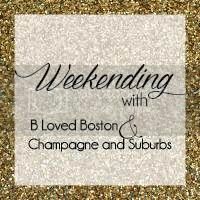 Sounds like a fab weekend! those flowers are so pretty, so cheap! i am so jealous of your ikea sofa table, that is such a great coincidence - not only did you not have to drive there, you didnt have to put it together, right?! thats the worst with ikea stuff. you ladies are so cute, i definitely would have been bundled up as well, as 70 is chilly to me!! lol. yay for your blog sale! i will of course stalk it! Love the behind the couch table! So much storage & looks great too! Love your Craig'slist/Ikea find and also that necklace...I still love it. I'm anxious to see if your manicure lasts. 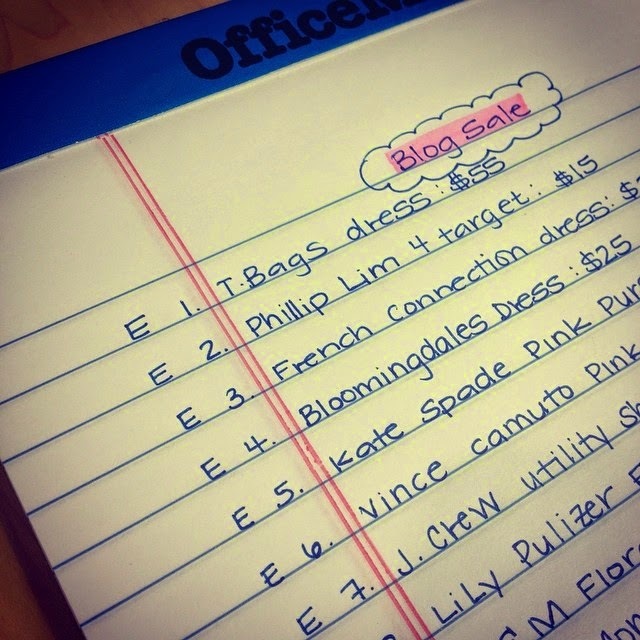 Excited to check out your blog sale tomorrow! And good luck to you on that! 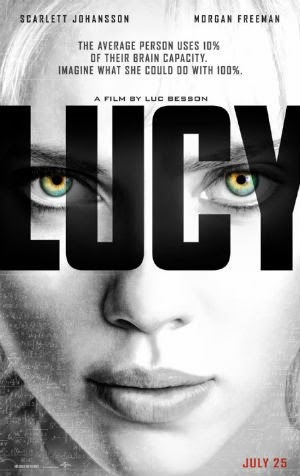 I want to see Lucy, but I heard it wasn't that great. What'd you think? Worth seeing in the theater or wait for Redbox? Nice work on the sofa table, it looks great! I have zero desire to see that movie because I can't stand Scarlett Johansssen. I've seen that nail polish at Walgreens and I'm definitely curious about it!! Those roses are gorgeous and love that price. I actually had that exact type of rose as part of my wedding flowers. :-) Love that necklace too! Glad that you had such a nice weekend, and that's great that you were able to see Amanda again too! A bonus to getting the table on craig's list is not having to put it together! I love getting fresh flowers I ussualy always pick some up when I grocery shop! And there even better from Trader Joes because they're so cheap! I love your new sofa table with bins for storage! What a great idea! I have been wanting to try that gel manicure too, you will have to let me know how it turns out! Love me some Trader Joe's flowers! Looks like a great weekend! I so love your new table!! It's fab!! I totally need one of those in front of my couch. Sounds like a great weekend!! And 70 is totally warm weather!!! I'm so excited for your sale. I have my eye on your Philip Lim bag!! ha!! Love the new table!! Glad you mentioned the gel polish -- I need to get some. Thanks for the link up. Yay! for the awesome find on Craigslist! It's always a plus when you don't have to travel 45 minutes! Trader Joe's has the best flowers don't they?!?! Your sofa table looks just like ours! Love it!! So fun that you and Amanda were able to get together again :) And I've been wondering about that gel nail polish. I may try it, we'll see. Glad you had a great weekend, Biana! Such a fabulous Craigslist find!!!! That polish!!! I've been wanting to try it but am too scared to take the leap! Did it apply fairly easily?! Can't wait to hear updates on how long it wears! Love love love that necklace! 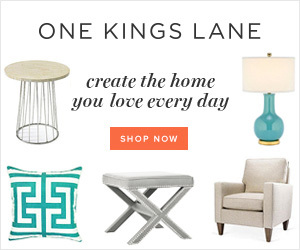 And your new sofa table looks perfect! Good idea with Craigslist, I'm going to be doing lots of furniture hunting on there! I need some of those roses in my life... Trader Joe's here I come! i love the sofa table. a CL steal! that risotto looks sooo delicious. i would have loved to have met amanda! :) so glad to see you guys having fun! That necklace, drooling over here! 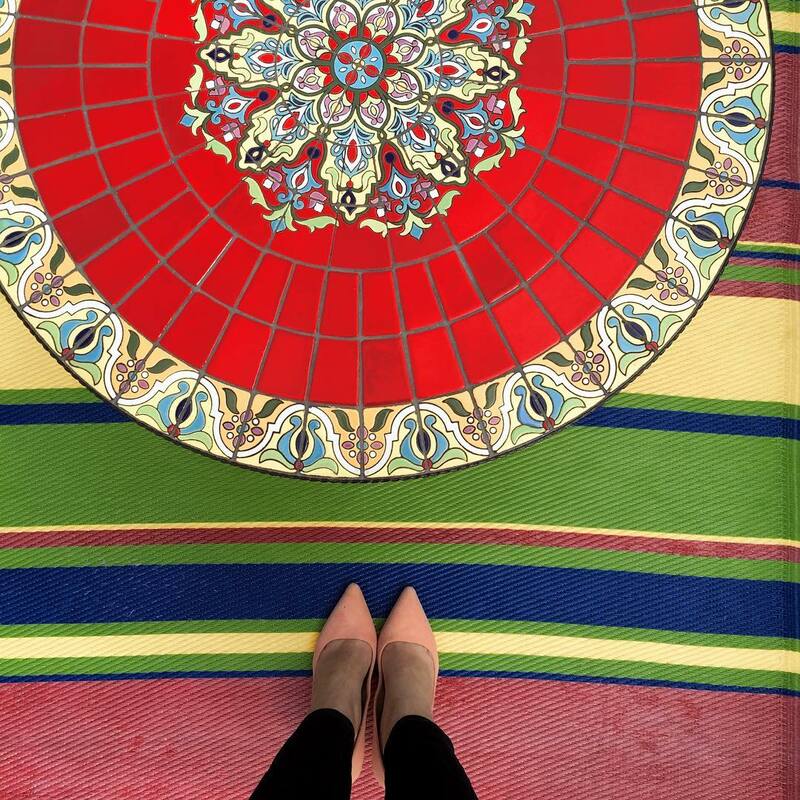 Love your new table and what a great find :) Can't wait to see your sale goodies! Talk about an awesome craigs list find - well done!! and I'm excited to see how the gel works - please let me know!! Love the new sofa table! Going to have to make that risotto soon, don't you just love some of her recipes?! Anxious to hear how you like the gel nail polish. I've now gotten addicted to shellac but I hate paying for something I could probably do myself. Such a fun weekend! I love ikea, but it is always pure chaos on the weekends and massive to navigate! The sofa table looks great! And the perfect find, too! Glad you had a great weekend, xo! SO much goodness. Loving the new piece you found (score), your necklace is stunning, I'm still super jealous/kinda bitter about Amanda visiting and your roses are lovely. Whew. Think that covers about everything! Happy Monday! sorry for the total space on not linking up this morning!! Yeah so awesome getting to hang with you this weekend now I am spoiled and want to do it more often! The table is perfect and I loved how you styled it! You have to let me know how that nail polish turns out you know how much I'm loving the complete manicure line! p.s of course you have the most flawless handwriting as well! That sofa table is gorgeous and it was obviously meant for you that you were able to find it 5 minutes away! SCORE! I cant wait for your blog sale! You should definitely include that gorgeous necklace in it (so that I can buy it), lol! Love that shelf with all the boxes! And that nail color looks cute! That necklace is super cute! I can't wait to see what you think of the nail polish, I have been early curious about it. Looks like you girls had a blast--blogger meet ups seem so fun!! Sounds like you have all become so close--and I am dying over how bundled up they are for 70 degree :) I am from Ohio and that sounds like summer weather hehe! Looks like a fun weekend! I love the sofa table that you scored. It's perfect. 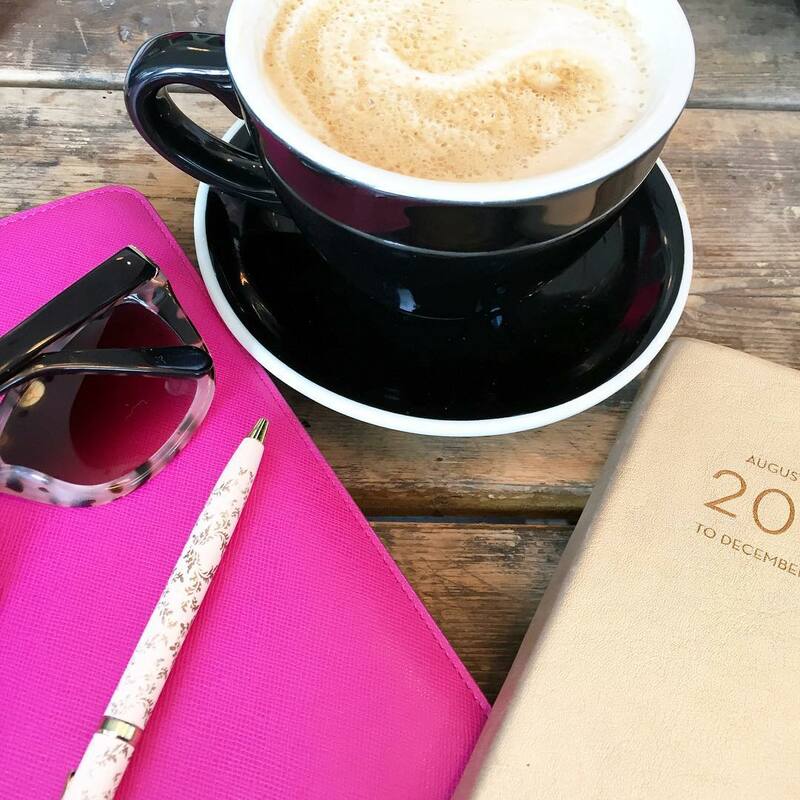 Meeting up with other bloggers is always fun! I would probably be bundled up too. lol Those roses are so pretty! Cheers to a new week! I just love the sofa table and the bins! So cute! I love how you mentioned the difference in dressing-- that's sooo true how warm temperatures to people in the south are not so warm to others! (does that make sense?? haha) So fun you got to see Amanda again though! I'm sure you guys had such a fun time. Also, I LOVE the piece you got for behind the couch- I can't believe you lucked out and found it on craigslist! Definitely beats having to go to an Ikea store! I can't wait to hear what you think of that polish- I've never tried gel, but that seems nice you don't need the light to go with it! 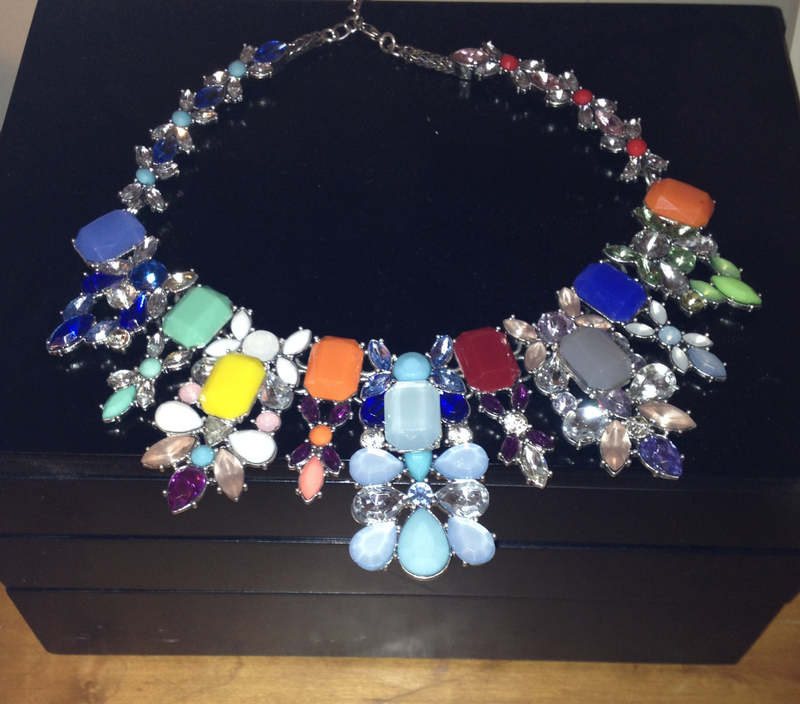 And to cap off this long comment- LOVE that statement necklace! Trader Joe's has great flowers- I can't leave there without some! Glad you and Amanda had fun! Dude. I WANT YOUR HANDWRITING!!!! That behind the couch storage unit is PERFECT! That worked out awesomely for you! That's so awesome that you found the couch table on CL! 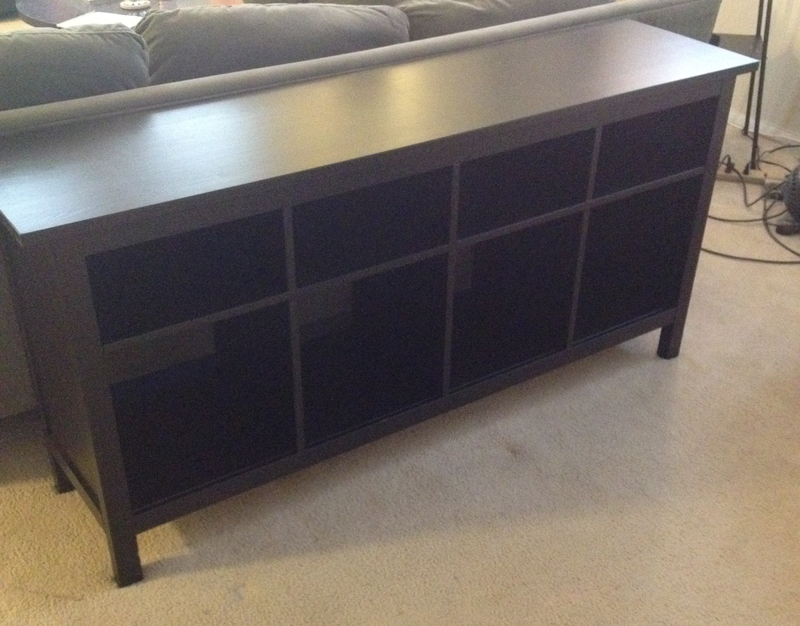 Not having to put things together from Ikea is my favorite reason for searching Craigslist ha! It looks great!! I have to get something similar and I love how this one looks! I want to try that gel polish too! I'm interested to see what you think of it after a few more days! i loveeeee those roses from TJ! They have the best stuff. That gemmy necklace is stunning! And I'm always grabbing some fresh flowers from Trader Joe's - such great quality for the price! AWESOME craigslist find!! I need to check there for a cofee table. Oooh love love everything in this! ha I was in ATL this weekend and it was in the 70s- everyone had boots on and I was in a dress! Love that necklace! So cute. LOVE your sofa table - it is the exact finish and style of the furniture in my place! And my friend Candace was just raving about the Sally hensen gel nail stuff too! Love the table you got and total score they lived so close! So awesome you got to see Amanda again! Those flowers are just gorgeous. I need to check out my Trader Joe's flowers make everything better!